US Interior Secretary Ken Salazar today suggested combining the Big Bend National Park in west Texas with the Monumento Natural del Rio Bravo across the river in Mexico, to form the Big Bend/Rio Bravo International Park, 1200 WOAI news reports. Actually, the idea of combining the two parks is not new…it was discussed by Presidents Franklin Roosevelt and Manuel Avila Camacho back in the 1930s. Salazar said he has had talks with Mexican Interior Secretary Juan Rafael Elvira Quesada about the idea. Salazar was the guest of Congressman Ciro Rodriguez, who’s district includes the Big Bend. “I’m proud to represent this area and look forward to having a dialogue with the Secretary about how best to preserve and enhance the park using stimulus funding and other resources,” Rodriguez said. Salazar said combined, the Big Bend and Rio Bravo constitute one of the largest and most important conservation areas in North America, and a combined park would help officials on both sides of the Rio Grande better address issues from water and air quality to management of wildfires. Rio Bravo del Norte is the name for the Rio Grande used in Mexico. Goldman Sachs has been playing both sides (consulting and giving financial advice to both the government and the private entities with whom the government is making deals) for quite some time now, especially with regards to public private partnership infrastructure deals. They’ve been operating with impunity despite the colossal conflicts of interest. Now it’s toxic wheeling and dealing has led to the financial collapse of Europe. The U.S. government beware – time to boot Goldman from the halls of Washington and Austin! We’ve seen it before. But in an election year during an economic downturn, it’s breathtaking — a room stacked with lobbyists and elected officials lobbying for higher taxes. Yesterday’s Joint Public Hearing of both the House and Senate Transportation Committees (more news coverage below) to discuss the state of transportation finance was what San Antonio Rep. Ruth McClendon defined as insanity, doing the same thing over and over and expecting a different result. McClendon feels that unless the political aspect of why road funding has not been properly addressed, all the public hearings and testimony won’t change the outcome. Ultimately, Governor Rick Perry has repeatedly threatened a veto of any increase in transportation funding other than his policy of privatized toll roads, and he’s managed to successfully starve or squander existing funding enough to accomplish his goal. Perry, David Dewhurst, Tom Craddick and Steve Ogden’s desire to raid teacher retirement and public employee pension funds to finance these risky toll road deals fell flat in the Legislature, a sentiment echoed in yesterday’s hearing. Once again, lawmakers tried to make the case that TxDOT is plum out of money and that higher taxes are needed to build more roads, while conservative legislator Rep. Linda Harper-Brown and a handful of conservative watchdog groups pushed back saying there’s already tax collected that’s not getting to transportation, which needs to be fixed first. Business interests like the Texas Association of Business and virtually all the urban Chamber of Commerce groups shamelessly advocated private toll roads, and every tax imaginable to go to roads. San Antonio Greater Chamber of Commerce President Richard Perez even asked for a “arterial collection” tax, which is code for tolling surface streets, not just highways. These hogs at the trough want no tax left “un-levied” to exploit the powers of government taxation and forcibly empty our pockets to fill theirs. They want it all — from a hike in vehicle registration fees and vehicle sales tax to property tax, sales tax, and basically taxes on anything that moves. Lawmakers again had a hard time discerning the true funding “needs” due to TxDOT persistently including projects not on the state highway system in its “funding gap” figures that started at $86 billion in 2006 (then was revised downward by $30 BILLION after the State Auditor found TxDOT had bloated that figure) and is now up to $387 billion. TURF also obtained sworn testimony from a former employee of the State Auditor that Perry’s Transportation Commission directed the agency to gin-up its 2006 funding gap so that it appeared insurmountable under the gas tax system (so it could push private toll roads as the solution to funding shortfalls). Distrust of TxDOT is the elephant in the room few lawmakers seemed prepared to address. Americans for Prosperity and Texans Uniting for Reform and Freedom, two of only three watchdog groups to testify (Eagle Forum didn’t show and Texas Public Policy Foundation was invited but declined) compared with 31 invited witnesses in favor of higher taxes without accountability, emphasized prioritizing existing funding first, like ending diversions of gas taxes revenues away from transportation, and cleaning up a broken TxDOT that continues to illegally use taxpayers money on lobbying for more privatized toll roads. Though the Texas Conservative Coalition echoed many of the same sentiments, its Director, John Colyandro, was taken to task by Chairman Senator John Carona for advocating the most expensive road tax while rejecting a more affordable gas tax increase. “How is that conservative?” asked Carona. While Colyandro stopped short of endorsing Rick Perry’s position of having all new capacity being toll lanes handed over to foreign corporations that charge 75 cents PER MILE to use public roads, he did advocate that private toll roads have a legitimate role as part of a mix of both toll and non-toll roads. Earlier in the hearing, Carona laid down the gauntlet asking, “I’m looking for someone to come and defend to me that a privately built toll road is less expensive than a free road ’cause it just ain’t so.” While Colyandro and many of the lobbyists and local politicians asked for the moratorium on private toll roads be lifted and remain “one of the tools in the tool box,” none could defend how that funding “option” was more affordable than a gas tax increase. Because it isn’t. It’s rather telling when even a so-called anti-tax advocate lobbies for the most expensive road funding option, but outright rejects the most affordable one. Considering all the campaign rhetoric from Perry claiming the Trans Texas Corridor (TTC) is “dead,” his highway department laid it to rest when it admitted on the record that it’s still alive and well in the transportation code. The Department still has the legal authority to move forward with it should Perry be re-elected. So once again, all the claims that the TTC is dead, are just plain inaccurate. In fact, one of Perry’s appointees to the Transportation Commission, Ned Holmes, asked at a Commission hearing last fall that the TTC-69 private toll contract be expedited. Two other pending TTC corridors, La Entrada de Pacifico and Ports to Plains are also actively being pursued. As part of the discussion on private versus public toll roads, several lawmakers queried TxDOT staff and Commission Chairwoman as to why public agencies can’t go to the bond market and fund these toll roads the same as a private operator can and even more cheaply since they can access tax-exempt bonds and don’t need to make a profit. The answer is it can stay in the public’s hands more affordably. Though Transportation Commission Chairwoman Deirdre Delisi tried to say the private operators can tap money the taxpayers can’t, it’s totally false. In fact, it’s the other way around. The private sector is exploiting the tax-exempt capital backed by taxpayers (like federally backed TIFIA loans and Private Activity Bonds, PABs, as well as other sources of taxpayer revenue like gas taxes to subsidize toll projects) in addition to its access to the private bond market, which charges higher interest rates resulting in higher toll rates. If a potential road is toll viable, the public toll entity can go to Wall Street and get private investors to fund the project using toll revenue bonds based on traffic forecasts. The private investors, not the taxpayer, are on the hook if the traffic fails to show-up to cover the debt. No public money has to be tapped when building a toll viable road. Delisi seemed clueless as to what a toll viable road even was or how one is funded, looking to TxDOT staff to bailout her out of answering the question. That’s because TxDOT hasn’t built any toll viable roads since she became Chair. Delisi also claimed there were no guarantees (where the taxpayers bailout the private entities) that the private operators would make a profit, yet an article in today’s Bond Buyer confirms there are. Under Perry, rather than scrap toll projects that won’t pay for themselves, he’s buried the taxpayers in massive amounts of new debt to SUBSIDIZE losing toll projects, socializing the losses and privatizing the profits. Pre-Perry, there was ZERO debt for roads. On Perry’s watch, $12 billion in debt has been amassed, not counting the off-budget debt local toll entities have had to incur to pick-up the slack for the State’s failure to properly fund STATE highways (and millions the Governor’s office has spent on roads for Colonias). Much of this money has been leveraged multiple times (using borrowed money as collateral to borrow more money, and often several times over), the same reckless financial methods that got us into the mortgage crisis and bailout era. If we continue down this road, debt service payments will likely eat-up our existing gas taxes at a faster pace than inflation, fuel efficiency, and diversions COMBINED! Though there’s some room to borrow more money for roads, the Texas Bond Review Board Executive Director warned, there’s not much available. Many of the State’s bond ratings have already dropped from AAA to AA+. Perry has basically maxed out the State’s credit card in just 5 years! Carona closed the hearing saying the committees planned to reach out to taxpayer groups next time around to try and reach consensus so that road funding issues get solved and not stonewalled for another session. From our perspective, more funding is a non-starter until they end gas tax diversions and audit and clean house at TxDOT, holding them accountable for the years of wrongdoing. AUSTIN — Undaunted by failure in the last two legislative sessions, North Texas leaders are organizing another push behind a local-option transportation bill that would authorize local elections to finance millions of dollars in road and rail projects. Officials from Fort Worth, Dallas and Arlington signaled their intentions at a joint hearing before the state House and Senate transportation committees Monday, saying that congestion and pollution have only worsened since a similar bill died in the closing days of the 2009 Legislature. The legislative initiative being prepared for the 2011 Legislature would allow county or regional elections in which voters would choose from a menu of funding options, such as an increase in gasoline taxes or auto registration fees, Fort Worth Councilman Jungus Jordan said in outlining the plan after the hearing. Jordan said proponents are tailoring the local-option feature for use in any region and plan to mount a statewide push on behalf of the bill. In another key difference from the previous campaign, Jordan said, proponent cities will rely on help from business groups instead of tax-financed city funds to pay for lobbying efforts for the bill. The measure is similar in concept to the 2009 bill, which Gov. Rick Perry and vocal conservative groups denounced as a tax increase. But Jordan said supporters will stress that urban residents are already paying millions of dollars in “hidden taxes,” such as lost productivity and increased business costs, because of traffic congestion. Arlington Mayor Robert Cluck, a physician, told lawmakers that proponents will also cite the public-health benefits of reducing traffic. He pointed out that pollution in the Metroplex carries the same consequences as smoking and exacerbates pulmonary illnesses. “As we get more and more cars off the street, the amount of asthma that we see will go down dramatically,” he said. More than two dozen suburban communities joined with Dallas, Fort Worth and Arlington in the unsuccessful effort to pass the 2009 measure, called the Texas Local Option Transportation Act. The larger municipalities also hired one of Austin’s premier lobbying firms, HillCo Partners, to help push the bill. “We didn’t stop after the last session,” Jordan said. Planners are still working out details but hope to have a draft within 30 to 60 days. North Texas leaders will also hold discussions with their counterparts in San Antonio, Houston, Austin, Lubbock, Corpus Christi, El Paso and smaller urban areas to form a statewide coalition, Jordan said. Metroplex leaders, he said, still have the same priorities as in 2009: finding money for up to 250 miles of commuter rail and expansion of the now overburdened road and highway network. “The unparalleled quality of life that we’ve built is severely threatened by our congested highways and roadways,” Moncrief told the lawmakers, saying that “many if not most” of North Texas residents are “fed up” with being stuck in traffic. The daylong hearing by the House Transportation Committee and the Senate Committee on Transportation and Homeland Security was called to explore funding options to help the state avert a looming transportation crisis. Some lawmakers are touting an increase in the gasoline tax, which hasn’t been changed since 1991. Deirdre Delisi, chairwoman of the Texas Transportation Commission, declined to take a position on the proposal but said the state needs financial stability to address “serious transportation challenges” over the next two decades. The state will run out of money for new transportation projects by 2012. A panel of Texas business and civic leaders appointed by the commission says the state needs to invest at least $315 billion through 2030 to maintain roadways, combat urban traffic congestion, and increase mobility and safety. EL PASO — State legislators on Monday began what will be a long and difficult process to create new revenue streams for highway construction in Texas. Money to relieve the congested freeways in the state has dried up and lawmakers have been left with the task of coming up with billions of dollars to relieve traffic tie-ups. The members of the Texas House and Senate transportation committee had a joint meeting in Austin to discuss how the state will come up with additional revenue to help build new roads starting in 2012. Both committees heard from mayors — including El Paso Mayor John Cook — transportation officials, lobbyists and business leaders during a meeting that began at 7 a.m. El Paso time and lasted until well past 4 p.m. Although no official plan was discussed, most of the conversation revolved around a proposed hike in the state’s fuel tax, which has been stagnant at 20 cents per gallon since 1991. Pickett’s committee, along with its counterpart in the Senate, began pitching a hike — or at least a retooling — of the fuel tax since last fall. According to figures from the Texas Department of Transportation, the state could be $250 billion behind in highway construction by 2050, when the population of the state will reach 50 million. “By January 2012, TxDOT will be dead-flat broke and without new revenues to build new roads. That’s a big issue,” said state Sen. Eliot Shapleigh, D-El Paso, a member of the Senate’s transportation committee. Shapleigh said the state should not only increase the fuel tax but also alter it to make sure fuel-efficient vehicles pay their fair share in taxes for new highways. Gov. Rick Perry, though, has said he will veto any bill that asks for an increase in fuel tax. “Both Perry and (Lt. Gov. David) Dewhurst have seceded from reality and they’re doing nothing to fix the problem,” Shapleigh said. Members of both committees conceded Monday that fixing TxDOT’s budget shortfall would require innovative legislation and changes to long-standing fee structures. Some of the proposed changes include increasing vehicle registration fees, pushing cities and counties to use the Transportation Increment Refinancing Zone funding mechanism, and forcing TxDOT to become more efficient. Officials also discussed creating a local option that would allow municipalities and counties to create local fuel taxes to help build local roads. Legislators said the state needs to be more in tune with the U.S. Department of Transportation to secure as much federal funding as possible. Many El Paso commuters, though, said they wouldn’t like to see an increase in fuel taxes, especially because gas prices have skyrocketed in the last five years. Pickett said he is concerned that the recent boom in highway construction — about $1 billion worth has been approved — in El Paso could make people think TxDOT is in good shape and that a fuel tax increase is not needed. AUSTIN — Texas lawmakers on Monday hammered home that without a new funding method, the Texas Department of Transportation will be unable to build any new roads beyond 2012 and will not have enough money to properly maintain existing roads within two to three years. They also demonstrated that finding a new funding solution they can agree on won’t be easy. Legislators on the Senate Committee on Transportation and Homeland Security and the House Committee on Transportation grappled with the use of “public-private partnerships” and comprehensive development agreements, or CDAs, that in some cases privatize toll roads. Senate Chairman John Carona, R-Dallas, chastised language often associated with toll roads, that drivers can “choose” to use them. Carona said it’s “disingenuous” to say drivers will have an option if the only way to fund new-road construction is by tolling them. “If every new road going forward is a toll road, that’s no choice,” he said. Looking into other potential sources of dollars, Sen. Eliot Shapleigh, D-El Paso, asked Texas Transportation Commission Chairwoman Deirdre Delisi whether her board, appointed by Gov. Rick Perry to oversee TxDOT, supported an increase in the gas tax, something Perry has said he opposes. Delisi said it’s not the commission’s role to determine how much the gas tax should be increased, that’s the Legislature’s job. Increasing the gas tax has been a political hot potato, but it’s an issue that’s gaining traction among lawmakers. It’s unclear, however, what chance it will stand during the 2011 legislative session. We heard explicitly in testimony at yesterday’s Joint Public Hearing of the House and Senate Transportation Committees that with regards to private toll road contracts, TxDOT stated that the private operator was taking all the risk, not the taxpayers. Well, the Bond Buyer reports differently (below). How is this a transfer of risk when Cintra is guaranteed profits if toll traffic dips below a certain minimum? Also, how is their access to capital better than the public’s when they’re using federally-backed TIFIA loans and PABs that are tax-exempt just like public sector toll projects? We now know the answer to these questions. See why the public doesn’t trust a word out of the mouths of TxDOT? DALLAS — With a statewide moratorium on new private toll projects still in place after more than two years, the Texas Transportation Commission is planning a bypass around that financial barrier to leverage existing funds. While the financial constraints exist statewide, the Dallas-Fort Worth Metroplex serves as the incubator in terms of innovative public-private finance, say Texas ­Department of Transportation officials. The latest scheme — one that will require rule changes and exhaustive risk analysis from department staff — would allow a private developer to design, finance and rebuild a 28-mile section of Interstate 35-East from Dallas northward to Denton in exchange for reimbursement from TxDOT. The finance method, known as pass-through tolling, is relatively new but well established with local governments, particularly counties. The system has never been used with a private developer, according to TxDOT. Nevertheless, current law allows the use of pass-through tolling by private companies. Link to article here. Illinois voters are no different than Texans when it comes to economics. The voters surveyed inherently know that when a private company takes over a public toll road, the toll rates will go up if for no other reason than private companies have to make a profit. One man quoted below also noted how a private company is likely to cut corners to drive up profits thereby decreasing the level of maintenance. Texas politicians beware: Texans, too, don’t want their roads privatized, and Texans don’t want higher transportation costs/toll rates. Politicians who hope to gain traction with voters by urging that the Illinois Tollway be leased to a private company might want to rethink their strategy. By overwhelming numbers, Republican and Democratic voters alike oppose privatization of the tollway system and believe it would lead to higher tolls, according to a Tribune/WGN-TV poll. The statewide poll of likely primary voters, conducted Jan. 16 to 20, shows Democrats opposing privatization 72 percent to 14 percent, with 13 percent undecided. Republicans oppose the idea 65 percent to 16 percent, with 19 percent undecided. Why? Among Democrats, 71 percent say tolls are certain to increase if the tollway is leased to a private company; 68 percent of Republicans feel the same way. The idea of leasing the tollway has been floated — and shot down — before, in Illinois and elsewhere. Several states are considering similar plans. GOP gubernatorial contender Jim Ryan recently became the most prominent candidate to suggest the plan. The former Illinois attorney general noted that a long-term lease of the 286-mile system could generate billions of dollars to fund public works improvements across the state. Ryan pointed to Indiana’s lease of the Indiana Toll Road for $3.8 billion as a guide. A consultant’s report commissioned by the General Assembly in 2006 estimated Illinois could receive up to $23.8 billion by leasing the tollway system under a 75-year contract. The estimate assumed increases in tolls by 50 percent every 20 years. These days, however, experts say a tollway lease would command far less because of the poor economy. The global credit crunch killed Chicago‘s proposed deal to lease Midway Airport for $2.5 billion last year. Tollway officials had no comment on such a plan. Critics say privatizing public assets amounts to a temporary fix. Many point to how Mayor Richard Daley’s deal to lease the city’s parking meters provided a one-time windfall but led to steep rate hikes, broken machines and unhappy users. “It’s a taxpayers’ asset, and I think it should stay with the state,” said Sidorowych, a property manager who drives the tollways for business. Chicago leased the Chicago Skyway to a Euro-Australian consortium in 2004 for 99 years for $1.83 billion. Since then, the toll for cars on the 7.8-mile stretch has risen to $3 from $2. The lease allows tolls to rise to $3.50 in 2011, $4 in 2013, $4.50 in 2015 and $5 in 2017. A benefit of the skyway lease is it frees the city from having to maintain the toll bridge, while providing long-term funding, said Laurence Msall, president of the Civic Federation, a non-partisan fiscal watchdog group. But the parking meter lease turned into a fiasco because the deal was struck with no public scrutiny, he said. The worst thing the state could do is use the proceeds from a tollway lease to relieve pressure on the state’s operating budget, which faces a $12 billion deficit, Msall said. State Sen. Jeffrey Schoenberg, D-Evanston, proposed leasing the tollway in 2006, but the idea was doused by suburban GOP legislators. Schoenberg said he finds it “somewhat ironic if not amusing” that some Republican candidates for governor are now talking up the same idea. Schoenberg also disagrees with those like Ryan who would suggest using lease proceeds for roads or infrastructure. The most prudent path, Schoenberg said, is to use the funds to pay down the state’s massive unfunded pension liability, estimated at $80 billion. This past fall, the tollway wrapped up its $6.1 billion rebuilding and widening program. But the five years of construction have saddled the Illinois State Toll Highway Authority with $4 billion in debt that won’t be paid off until 2034. And state law requires toll revenues to be reinvested in the tollway, not channeled to other agencies or the state’s general fund. Keeping the system the way it is works just fine for Tammy Clayton, 46, of Harvey, a postal worker who commutes 100 miles a day on the tollway. 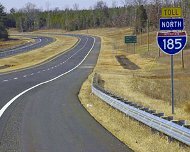 Southern Connector toll road in Greenville County, South Carolina finds itself $169 million in the red. The first public-private partnership toll road established as a not-for-profit corporation has gone bust. The Connector 2000 Association, which operates a sixteen-mile, four-lane toll road linking Interstates 85 and 385 in southern Greenville County, South Carolina, announced last week that it was in default on its financial obligations. “Without innovative financing, this southern loop around the city of Greenville would be nothing more than a dream,” a SCDOT brochure boasted. Like other highly-leveraged tolling efforts, the Connector was hampered by unrealistic traffic projections and rosy financial scenarios for an area expected to experience an economic boom. There is little hope for the road’s recovery. In 2009, the association collected $3.9 million in tolls from motorists. Because SCDOT decided not to make the Connector a freeway, the majority of that revenue was swallowed by $2.8 million in expenses for things such as consultant fees, marketing, toll collection employees and legal fees — most of which would not be required if operated as a free road. With such a constrained cash flow, the road could not come close to meeting its $13.1 million annual bond interest obligation. The toll road’s bond payments had been insufficient since 2004, and now the association’s net deficit stands at $169 million. As a result, Standard and Poor’s downgraded the toll road’s bonds from C- to the lowest possible rating of D. A copy of the road’s latest financial statement is available in a 600k PDF file at the source link below. The Big Picture/with Mark Anderson,American Free Press deputy editor, www.AmericanFreePress.net; and host of RBN’s When Worlds Collide, broadcast Saturdays from 7 to 9 p.m. Central; Call in, 800-313-9443. Outraged Texans are coming out swinging in early 2010, continuing the brutal fight against the outright privatization of public highways — trying to avoid getting steamrolled by Wall Street “highwaymen” and their political allies who would deprive Texans and all Americans of the ownership and cost-effective use of highways already paid for with gasoline taxes. Watching a state like Texas tells a great deal about what could happen anywhere. So, AMERICAN FREE PRESS has been monitoring the Texas situation for more than three years, as the drama plays out on whether the Trans-Texas Corridor – a pivotal piece of the proposed NAFTA Superhighway system for engineering the physical aspects of the North American Union scheme – will be built to any irreversible extent; and whether existing freeways will be converted to toll ways in a privatization scheme to cancel any competition that freeways would pose to aggressive plans to toll any highway with enough traffic for manipulators to make money. These financial sharks tempt the cash-strapped states with quick money by acquiring freeways from them and transforming them into for-profit toll ways. Or sometimes state-controlled toll ways are privatized under long lease agreements, as happened with the Indiana Toll Road. Tolls of 75 cents a mile are a distinct possibility in places such as Dallas-Fort Worth, an area whose destiny appears to be the U.S. “toll” capital. The usual suspects will leave no road un-tolled here — and abroad — if we let them get their way. Yes, Goldman-Sachs is creating a “highway market” to control. Meanwhile, the Rothschilds are reportedly among the major financial forces privatizing the roads in Britain. The domestic scene’s latest developments included a Jan. 11 final public hearing in Texas on a plan to charge tolls on the northbound lanes in San Antonio’s large 281/1604 Interchange. San Antonio Toll Party (SATP) members turned out to protest the plan. From there, the SATP meets Jan. 21 at the Big ’Z Burger Joint in San Antonio at 2303 North 1604 W — mainly to prepare for a major hearing of the Senate Transportation Committee on Feb. 1 in the capital of Austin. AFP plans to attend. Those in AFP’s growing Texas readership take note: This Austin meeting, to take place at 8 a.m. at the Capitol Extension Auditorium, will focus on statewide road funding alternatives. It’s a concept called “value pricing” in which the “value” all goes one direction — into the fat cats’ pockets. Building a toll road that you are forced to use has the same effect as paying a higher tax on gasoline. Whether a highway is free, or you are tolled, you still pay 38.4 cents in federal and state gasoline taxes. That is the baseline. Assuming that your vehicle averages 20 miles per gallon, if you drive 20 miles on a toll road charging the maximum 75 cents per mile, you pay your 38.4 cents in current gas taxes plus another $15 in tolls. Thus, the combined tolls and taxes to drive on that road total $15.38 per gallon of gasoline. And to think Americans griped when gas was $4 a gallon. Yet, the ultimate problem is that more toll ways in any state will create a vast “highway market” [read: racket] by privatizing all major public roads so the NAFTA Superhighway, in Texas and beyond, can be waiting in the wings as a major blow against territorial sovereignty. It also is a surefire way to further impoverish the masses who already had what should be a publicly-controlled asset – the creation of money itself – taken away from them starting in 1913 when the Federal Reserve was born. Now, roads – which, like money, are used by nearly everybody on a daily basis – may be the final frontier for the elite monopolists whose tentacles pull at the grassroots and span the globe. No further evidence is needed for former Transportation Secretary Mary Peters’ motivation for her statement below. She’s lobbying lawmakers to end the moratorium on private toll road contracts (called CDAs or PPPs) that sell our Texas roads to the highest bidder on Wall Street and grant monopolies to private corporations because she’s the hired hand of Zachry, a major beneficiary of these contracts! Texas lawmakers should reauthorize private toll roads in the Lone Star State when they return to Austin in 2011, former U.S. Transportation Secretary Mary Peters told Texans Thursday. With little likelihood that Congress will pass meaningful transportation reform, or find long-term funding solutions, in 2010, Peters said states will do well to send strong messages that they are doing their part to solve their transportation challenges. Toll roads, and the ability to attract private investors to pay for them, are one way many states, including Texas, have used to do just that, she said. Peters spoke at the annual Texas Transportation Forum, a talk fest sponsored by the Texas Department of Transportation involving hundreds of engineers, local officials, financiers and others. The issue of private toll roads will return when the 2011 session of the Texas Legislature begins. Both candidates for governor — Perry, the incumbent, and Sen. Kay Bailey Hutchison — have said they support private toll roads, though Hutchison has said Perry has placed too much emphasis on tolls in general as governor.Congress has been struggling with transportation financing for more than a year, as the 2005 authorization bill formally expired last year. It has been extended by a series of emergency spending measures, but states like Texas have faced uncertainty about whether they can count on the federal government to provide the funding needed for projects currently under construction.She said rather than bite the bullet and pass the massive reauthorization bill — one version of which, introduced in the House last year, would cost $500 billion — Congress will opt instead to pass the Jobs for Main Street bill as a kind of second stimulus, make a few changes to keep the highway trust fund solvent and put off the tougher questions about transportation funding until 2011, she said.The jobs bill, lampooned by Republicans as “son of stimulus,” totals $154 billion, she said. “I do think the Jobs for Main Street bill will pass this year, in some form, but I think it will be passed at the expense of a long-term reauthorization bill,” she said. “I just don’t think the political will is there (to pass transportation reauthorization). If the jobs act does become law — and it faces opposition in the Senate — it would mean nearly $40 billion more for American highways, perhaps as soon as later this year. That’s almost as much as the states received for roads and bridges in 2009 as part of the first — (and much larger) stimulus package. Texas would receive about $2.5 billion, about the same it received in 2009. Cornyn, Pickett to speak this morning; Meanwhile: Is ‘transportation crisis’ real? Probably the most interesting thing that former Transportation Secretary Mary Peters said yesterday was that the reason efforts to convince Congress and Texas lawmakers alike to get serious about providing long-term solutions to transportation is that lawmakers, like voters, have not yet accepted as true claims that we are in the midst of a transportation crisis. Until they do, she said, no serious change — and that includes no serious discussion of new revenues or taxes — will take place. And lawmakers won’t believe it’s a crisis until voters do. That we’re in the midst of a transportation — and other infrastructure — crisis is an article of faith among most of the folks at this annual Transportation Forum, as it is for leaders of the Texas Department of Transportation, local officials that lead the Regional Transportation Council in North Texas, and crusading lawmakers like Texas Sen. John Carona. The problem is, most folks get to where they want to go just fine: The roads are more or less smooth, the bridges don’t collapse (other than that one in Minneapolis) and the water comes on when you turn on your faucet. Where’s the crisis? Truth is, most people experience the transportation crisis as a commuter irked by traffic jams — but most of us even get use to those over time, and as long as they are steadily worse, and not suddenly worse, we don’t get crazed about it. Instead, the more immediate “crisis” for most Texas drivers is the one affecting their wallets — the higher tolls and sometimes higher gas prices. None of this is to suggest that Carona and the other folks urging real solutions — and higher taxes — for transportation are wrong. They’ve certainly got the big picture down of how a city and state continues to grow and attract business and jobs, and clean its air — and all of that stuff is going to take money, or it will cost us money down the road if we don’t act. I get that. But Peters, who believes that we do have a crisis, is right to say that the challenge the planners, politicians and engineers face when trying to make change is that so far, most folks simply don’t believe them. And even when in their heart of hearts they think something needs to change, they don’t trust the system to get it right. I’ll write more this afternoon, after we hear from a series of federal lawmakers — most of whom we can expect will tell us we’re in a crisis. Texas House transportation chairman Joe Pickett will speak — he’s one of the guys pushing for a gas tax increase in 2011 — and so will Sen. Robert Nichols, who knows his way around transportation, too. At noon, Sen. John Cornyn speaks and I’m interested to see if he takes on transportation seriously as he prepares for a likely future as the state’s senior U.S. Senator. He’s not been big on transportation on the past, but it’s interesting to see him on the line up with a keynote address. More on that, and much else, later right here, on the transportation blog. AUSTIN — Sen. John Cornyn said today that private toll roads should be part of the solution as government leaders in Texas and in Washington struggle to pay for new roads, bridges and other transportation infrastructure. They just shouldn’t be the only solution, he added in a speech the closed a half-week of transportation chit-chat among hundreds gathered for the fifth annual Texas Transportation Forum. “The first solution many people point to is say, ‘We can solve this with more money.’ Certainly, money can solve a lot of the problems but it can’t solve all of them,” Cornyn said. If government leaders did a better job of explaining the choices Texans face when it comes to paying for roads, they might be more supportive of not just new toll roads but even other expenses, like higher gas tax rates. But for now, he said, government has done too poor a job in discussing those realities — as evidenced, he said, by the voter pushback that led lawmakers in Austin to end the state’s authority to enter into new private toll road deals. He stopped short of explicitly calling on Texas lawmakers to restore the authority for private toll roads in 2011, as former Transportation Secretary Mary Peters did on Thursday. When asked after his speech if he would flatly rule out a higher federal gas tax, he declined to do so. Instead, he said that he’d leave it up to voters to decide what they are willing to support after their leaders have done a better job of explaining the trade offs involved. If drivers felt they could get a quicker ride to work for a reasonable increase in tolls or other fees, they might sign on, he said. Earlier Friday, Texas House transportation chairman Joe Pickett, D-El Paso, told the same audience that the 2011 session will be extremely tough for any efforts, including his own, to raise taxes or even to shift funds away from other items to spend more on transportation, as Gov. Rick Perry has said is a better approach than raising taxes.”We’re already being told behind the scenes that his is going to be very tough budget session,” Pickett said. Add to that, he said, the forced politicization that will come about as a result of redistricting — and it means 2011 is going to be a very difficult session to reach compromises over transportation funding. He got a laughs for the I hate you line, but his point is that real compromise across party lines will be tough in 2011. And in a year when budget writers will be worrying about every penny, he said support for ending the diversions will be hard to find.